How much does your rideshare driver earn? Are you looking to become a rideshare driver and wondering how much money you can earn? Look no further, we have some answers for you! The amount you can earn depends on which service you are looking to drive for and which city you'd be operating in. With RideGuru, you can see the big picture of how much drivers earn for each service. 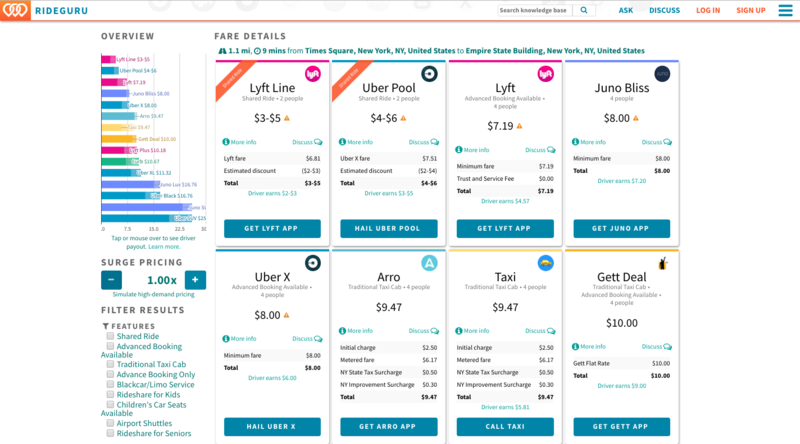 Here's how you can use RideGuru to compare driver payout between different rideshare services! 1. Type in your TO and FROM addresses into our Fare Comparison Calculator or download our iphone app to use the calculator on the go. If you're a driver, search two locations in the city you'd like to drive in. 2. View the results page as seen below. You will see a summary of the cost of your ride for each of the rideshare services we support in your area. 3. Once you pick the service you would like to use, you can even look in detail to find out how much the driver will earn on your specific ride. For details on how the driver payout is calculated, our driver payout page illustrates exactly where the number comes from. This page will also be helpful to figure out how much you can earn for each service, and you can compare driver earnings against different cities in the U.S.!